As you guys read this, I will be in San Antonio!! I wish I was there longer than one weekend, but it will be good to be home regardless. It's my goddaughter's 1st birthday - I missed her baby dedication a few months ago because I was home with strep and had to cancel at the last minute. Her birthday made for the perfect excuse to reschedule my trip! You know what I realized is the perfect travel outfit? This jumpsuit. This is the same one I dressed up for a date night with the husband a few weeks ago here. All I needed was a scarf to double as a wrap in case I get cold, and otherwise, I was good to go. And if you think about it - I never ever use the restroom on the plane, so the inconvenience factor of getting dressed in and out of a jumpsuit is suddenly a non-issue. Genius, I tell ya. Because you all seem to like the behind the scenes stuff - I also tried tying the scarf the way I did it in my infamous scarf tying video here. It made me feel like a bank robber though with this outfit, so I switched it to the more traditional way. Out of curiosity - which do you prefer? Funny how much shorter the scarf looks the more traditional tying method. Love the scarf girlie! I hope your weekend is great! So bumped I missed out on that express romper, it looks so comfy. Awww I'm bummed for you!! It's a great piece! That is a great travel outfit. I love the way you paired it with a colorful scarf. Happy Friday! Thank you! The scarf keeps it from being a bit boring! 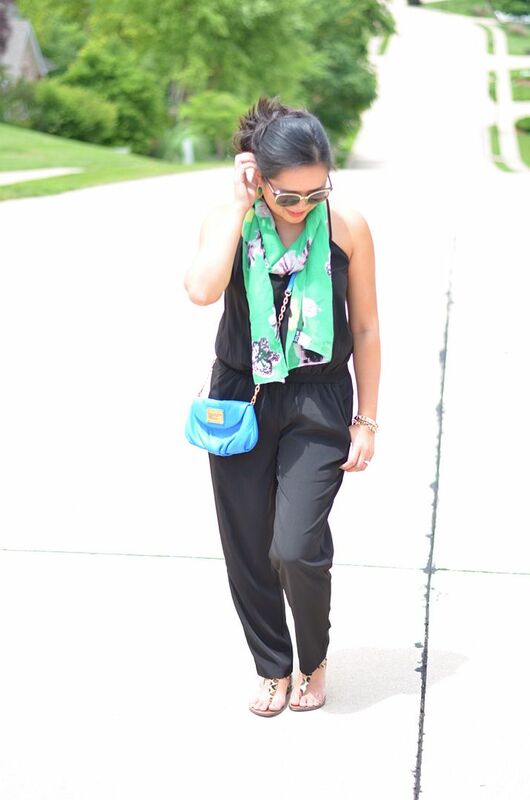 Anything that is loose a great travel outfit. Great mines think alike :D. You look lovely as always. Yep - totally agree. Love being comfortable and able to move around! Hm, you know, I agree with your decision on the traditional scarf tie for this. I think the infamous scarf tie is better for colder weather when it's part of other layers and more covered up pieces. For this I like the open, relaxed feel of the regular tie. Excellent choice, cute look altogether, and I'm impressed that you never use the bathroom on on airplane!! Though I made the bad life choice of having an iced latte before we boarded so about halfway through the flight, I had to potty sooooo bad but I refused out of principle! Haha oops. Ha. The thought of the bathroom issue popped in my head right away but I also try my hardest not to use the bathroom on the plane. It is the perfect travel outfit and I like the looser scarf look. Yes, and I realized it's easier for going through security also and not having to worry about untying it and re-tying! The scarf is so cute with the jumpsuit! I also try to avoid the plane bathroom but it seems every time I fly, I immediately have to pee, haha (probably from nerves!). 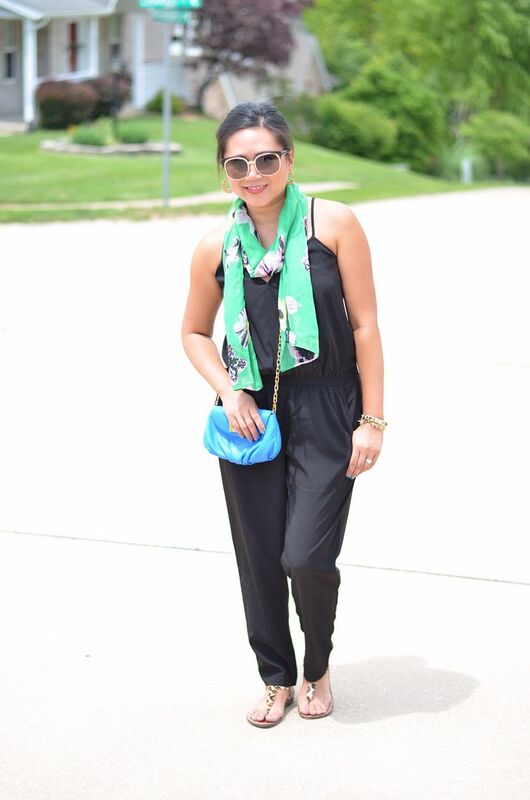 Love the print on that scarf! It pops against the black! Color is a must for me! Thank you! Both ways of tying the scarf give it a different feel and I like them for different reasons. The triangle shape brings in more pattern and color into the outfit while the more traditional wrap adds length. I agree about showcasing the pattern! I will have to tie it like this in the winter! I love the triangle way of tying the scarf I think but only because the other way is quite 'standard'. I love the colour of the scarf against the black. She would totally look fab in one, huh??! And oh man, I survived the flight without a potty break, but I had an iced coffee which made me *almost* break my no-potty rule!! Love the toned down look with this jumper as well, it truly is fab! Thank you! I'm really surprised with how much I love this thing! I'm glad you agree - thanks! !